Our stunning Platinum Series Solid Oak 18mm x 120mm Hand Scraped UV Vintage is a generous 18mm thick solid oak floor that may be sanded and re-sealed up to 10 times during the lifespan of the product. This allows the floor to change with your style and personality as it can be treated, stained and varnished to suit any décor. The special "Hand Scraped Finish" is one that is highly desirable, as it gives the floor a look of far greater age than it actually is. This character is also exemplified by the stained finish, giving the floor a much more authentic appearance, and the lacquer sets these off with a subtle sheen. The random board lengths will be highly advantageous to your fitter as well, as the staggered effect makes every plank look special and individualized. The bevelled edge also adds to this emphasisation. Like it's sister floors, the UV Castle is a highly durable and attractive floor. It's rustic graded, so you know that you'll be getting an entirely original floor in your home. 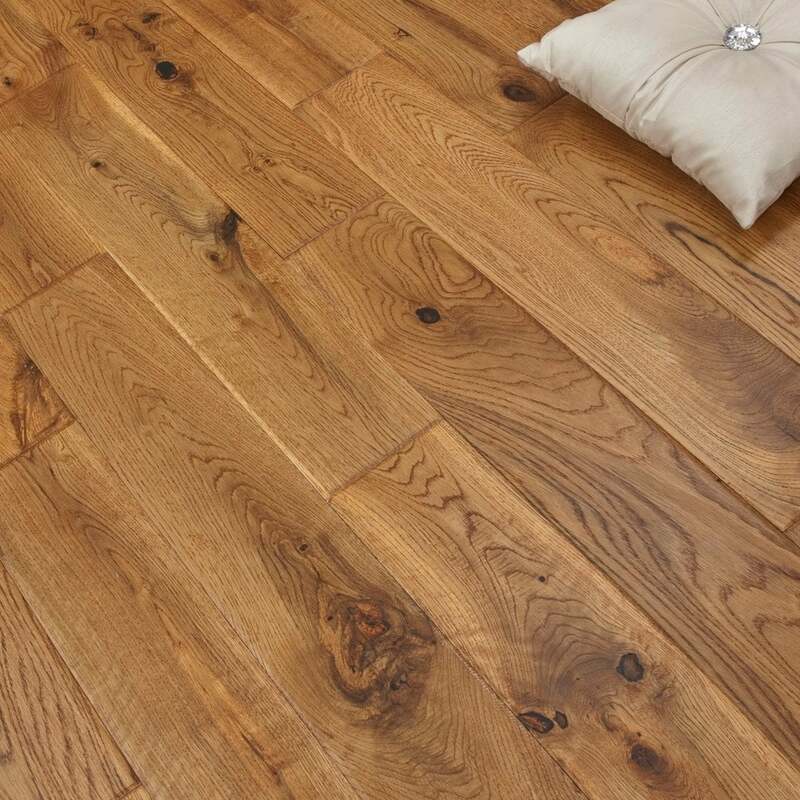 The variation in shading and knots will add natural charm that cannot be achieved with a laminate, and with 120mm wide boards, any smaller spaces will gain a bigger impression through this floor. As this floor is a mid-light shade of oak primarily, you can use any colour scheme around it. The sheen of the lacquer will help to bounce light and open the room up beautifully. Still not sure? Request a FREE sample! The product has a total thickness of 18mm giving the opportunity to sand the product down several times and refinished to make it looks as good as new. The top quality lacquered finish of the boards allows for greater resistance to spillages and scratches. The high gloss nature of a Lacquered product will reflect light and add character to any room and the deep hand scraped effect adds an exquisite rich variety. This is a random length product, adding to the overall grandeur of the room and allowing for a natural look. This product is BCD grade allowing for greater colour variation and adding emphasizing the character of the product in every installation as well as creating a classical wood feeling. This product is a standard width 120mm board which will be suitable for room installations of any size. This product has a superior natural appearance thanks to the different wood grains complimenting the unique transforming look of each plank. Really good quality flooring, clicks in easy ,and looks totally amazing, the flooring has great feel and has been complimented many times. I would definitely recommend this flooring, and it was cheapest price for the thickness and quality. Very quick delivery. Just a little too leave it in a room for a couple of days before putting it down. Sent the right sized sample unlike many others who do not or never send. Excellent quality and well priced. first would like to thank discount flooring for the quality and fast delivery ,its nice wood match everything in my living room the floor man who fitted on took a sample and will buy the same really happy with it . This floor is the perfect colour to match my interiors. Counld't be happier!